A site-specific dance celebrating the Tenderloin's outcast activists who’ve defied conventions for the past 100 years. Now is a crucial moment in American history to both value resistance and to understand it in a historical context. From its inception 21 years ago, politically responsive content has shaped Flyaway’s performance events. With your support we have built a body of work that brings women’s stories out from the margins. In the last 7 years, Flyaway has offered the Tenderloin a trio of free, large scale site-specific dances that spoke to income inequality through a feminist lens. 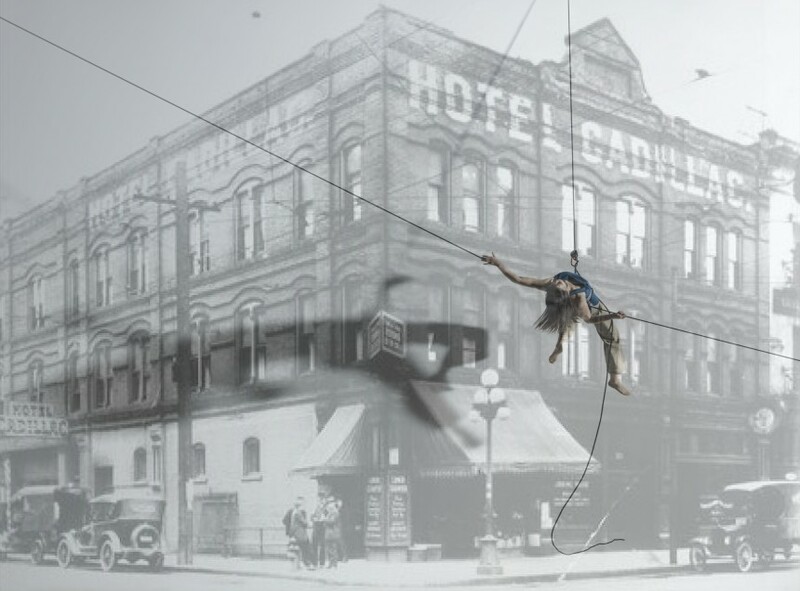 Spring 2018, Flyaway Productions continues this tradition with a new work,TENDER (n): a person who takes charge – a celebration of 100 years of OUTCAST ACTIVISM IN THE TENDERLOIN. Set on two walls of the Cadillac Hotel (380 Eddy Street, SF), TENDER (n) is our largest site-specific dance project in years. TENDER (n) celebrates the outcasts who have defied convention here and the unlikely activists who have sought, in almost every decade, to create a desirable place to live and thrive: Young, single women in the 1900s; Gay/Trans Activism of the 1960s; Immigrant families from Southeast Asia in the 1970s; and Kathy Looper, owner of the Cadillac Hotel, the first SRO West of the Mississippi. Each performance project takes 2 years to develop, during which time, Jo brings together multiple partners, community based organizations, and the public in a community dialogue around a single issue. TENDER (n) is being created by Flyaway Productions in partnership with the Tenderloin Museum, Code Tenderloin, the Asian Art Museum, the Au Co Cultural Center and composer Vân-Ánh Võ, one of the world’s finest performers of Vietnamese traditional instruments. On GIVING TUESDAY we appeal to you to help us make TENDER (n): a person who takes charge, and to help us keep our performances free. Your tax-deductible donations will support dancer fees, an innovative set, and activities with the community. Thank you.